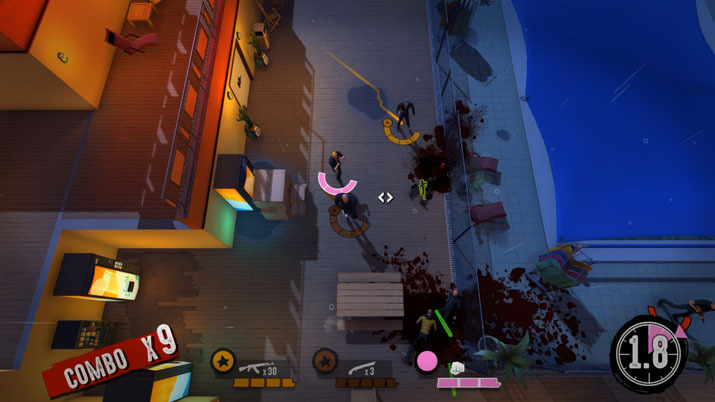 It’s fairly obvious that, in making Reservoir Dogs: Bloody Days (RD:BD), indie developer Big Star Games sought to take advantage of the film’s cult-like popularity. These undertakings, history shows, can often be double-edged swords. 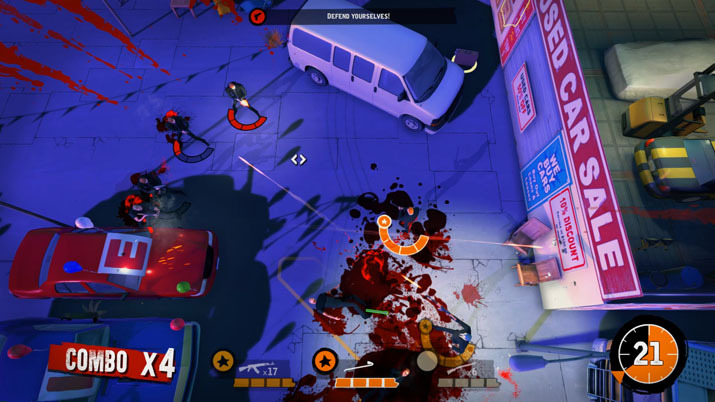 A video game based on a classic like Reservoir Dogs inevitably sets expectations high, and if the development studio and, by representation, its publisher are unable to meet them, the backlash of angry feelings does them reputational damage. Already in 2006 the attempt was made by publishing giant Eidos Interactive, who released a game backed by Lionsgate that appeared to be a GTA clone with Tarantino flavors. Reviews were negative, and the idea of video game adaptations quickly dropped. Now more than a decade later, RD:BD represents a renewed attempt at taking the intellectual property into the world of video gaming. We know that, when Big Star Games pitched Lionsgate the idea for an RD-themed top-down third-person shooter, the media company accepted but with imposed restrictions: the characters must not look like the actors from the movie, and the narrative of the game must in no way tie into the plot*. The debilitating consequences for RD:BD is that a frame story is missing. The writing doesn’t excel. The dialogues are more like fillers in between levels and go for a gangster bravado that feels stilted along with the gratuitous use of expletives. On the upside, characters have their own forlorn-hope-gangster feel. The next best thing after paying royalties. The same can be said about the music. The soundtrack of the movie is an essential part of its brand, and RD:BD’s developers clearly agreed: songs sound like the ones from the movie -- but aren’t. Then is the limiting factor that Big Star Games wasn’t allowed to use the actors’ likenesses. The alternative to Tarantino’s visuals is a cartoonish look. It works. While any adapted elements from the film had to be considerably altered, RD:BD’s to the studio’s merit still carries much character. Visuals may not be the real deal, but an impressive display of creativity made character design a strength for the game. Appearances also feel unique and memorable. Imagine Mr. Brown with his buzz cut and prominent chin, think Mr. Pink with his wavy blonde hair, caricatured. RD:BD delivers substance through gameplay, with an unusual time-rewind feature. RD:BD’s missions consist of entering a venue, creating a ruckus, stealing valuables, and then shooting your way out against the police. This all happens in a third-person, top-down view. It would remain a generic game with the RD label slapped on if it wouldn’t have one remarkable gameplay feature: a time-rewind function. You play with two to three members of the Reservoir Dogs gang who--like in the movie--are chromatically named Mr. White, Mr. Blonde, Mr. Brown--you get the gist, and have different strengths and weaknesses. You move the first character, let’s say, Mr. Brown, for as long as you need. On the way, you shoot policemen, take loot, and then you go into cover. At this point, you press the spacebar and time rewinds to the beginning of Mr. Brown’s movement. While he begins to move exactly like he did before, you now control Mr. Pink with whom you can offer support to your partner, or pick up loot that he couldn’t reach from his position. You do that while Mr. Brown moves. After that, your control switches back to him. In this way, you control your players alternatingly, so that they complement each other in the execution of their mission. The first missions struck me as simple with the danger of repetitiveness looming. The sequence always consisted of the same three actions: run, shoot, rewind time. After the first couple of missions which seem purposely simple to let the player experiment with the gameplay mechanics, levels increase in difficulty and require more coordination of the characters. While the player actions remain the same, the pace of the game picks up, and it becomes challenging. A nice detail is the range of weapons from baseball bat to M16, each with their specs so that you think about which character ought to use which weapon to leverage his strengths.